Among those who make profession of following the maxims of Christ, simplicity ought to be held in great esteem; for, among the wise of this world there is nothing more contemptible or despicable than this. Yet it is a virtue most worthy of love, because it leads us straight to the kingdom of God, and, at the same time, wins for us the affection of men; since one who is regarded as upright, sincere, and an enemy to tricks and fraud, is loved by all, even by those who only seek from morning till night to cheat and deceive others. -----St. V. de Paul. This Saint himself truly had great esteem for simplicity, and loved it much. Therefore, he not only kept himself from any transgression against it, but could not suffer those under his authority to commit any. If at times they were guilty of doing so, he would be sure to correct them for it, though with great mildness. 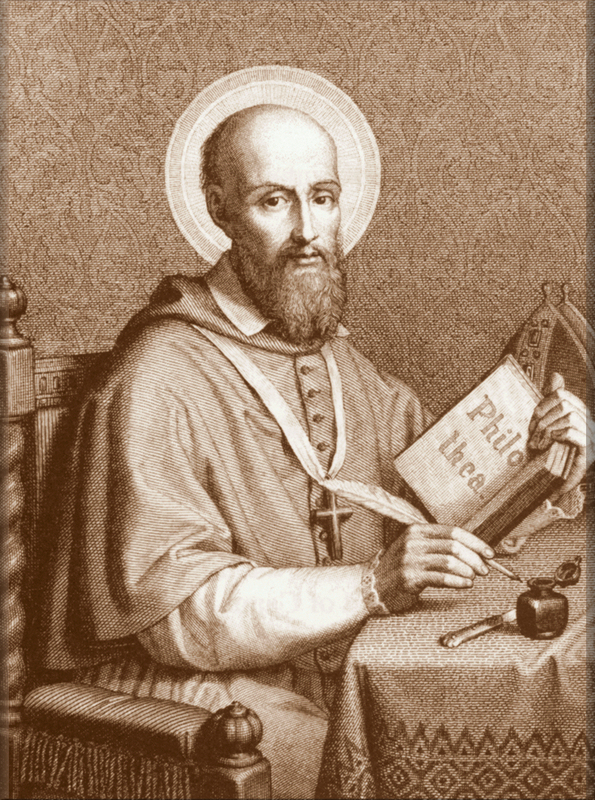 St. Francis de Sales, also, was full of respect and love for this virtue, as he once declared to a confidential friend, in these words: "I do not know what that poor virtue of prudence has done to me, that I find so much difficulty in loving it. And if I love it, it is only from necessity, inasmuch as it is the support and guiding light of this life. But the beauty of simplicity completely fascinates me. It is true that the Gospel recommends to us both the simplicity of the dove and the prudence of the serpent; but I would give a hundred serpents for one dove. I know that both are useful when they are united, but I think that it should be in the proportion observed in compounding some medicines, in which a little poison is mixed with a quantity of wholesome drugs. Let the world, then, be angry, -----let the prudence of the world rage, and the flesh perish; for it is always better to be good and simple, than to be subtle and malicious." St. Phocas the Martyr was greatly to be admired for his simplicity, according to what Surius relates. He cultivated a little garden, less to provide food for himself, than to supply with vegetables and fruit those travellers and pilgrims who had heard of his liberality, and stopped at his house; for no one ever knocked at his door, who was not received with great charity and courtesy. This holy man was denounced for aiding and abetting Christians, to the governor of the province, who, resolving upon his death, sent soldiers privately in search of him, with orders to kill him. They arrived, one evening, at his house, not knowing that it was his, entered it, and, with the usual freedom of soldiery, demanded food. According to his custom, he received them willingly and kindly, and gave them what little he had. He served them, too, at table, with so much charity and courtesy that they were delighted and captivated, and said between themselves that they had never met such a good-hearted man. And so, they were led by his great simplicity and candor to ask him with confidence, whether he knew anything of a certain Phocas, who helped and harbored Christians, and upon whose death the imperial prefect had resolved. The Saint replied that he knew him very well, and that he would willingly point him out to them, so that they might go to rest quietly, without further inquiry, for on the next day, he would show them an easy way of capturing him. He then spent the whole night in fervent prayer, and, when it was day, he went to visit the soldiers, and bid them good morning, with his usual cordiality. They answered by reminding him of his promise to deliver up Phocas, whom they were seeking. "Do not doubt," he returned, "that I will find him for you. Consider that you have him already in your hands." "Let us go, then, and take him," they answered. "There is no need of going," replied, "for he is here present. I am he. Do with me what you please." At these words, the soldiers were amazed and stupefied, both on account of the great charity with which he had welcomed them, and of the ingenious sincerity with which he revealed himself to his persecutors, when he could so easily have escaped death by fleeing in the night. They gazed at each other in amazement, and neither of them dared to lay hands on one who had been so kind to them. They were more inclined to give him his life, and to report to the prefect that after long search they had not been able to discover Phocas. "No," said the Saint, "my death would be a less evil than to concoct such a fiction, and tell such a falsehood. Execute, then, the order you have received." So saying, he bared his neck, and extended it to the soldiers, who severed it with one stroke, and gave him the glorious crown of Martyrdom. This most candid fidelity was so agreeable to God that He immediately began, and still continues, to signalize it by illustrious miracles, especially in favor of pilgrims and sailors, to whom, in death as in life, the Saint has been most liberal of benefits and miraculous helps. In recognition of this, a custom came into use among travellers by sea, of serving to him every day at meals a part of the first dish, which was called the portion of St. Phocas. This was each day bought by one or other of the voyagers, and the price deposited in the hands of the captain; and when they came into port, the money was distributed among the poor, in thanksgiving to their benefactor for their successful voyage. Simplicity is nothing but an act of charity pure and simple, which has but one sole end, that of gaining the love of God. Our soul is then truly simple, when we have no aim at all but this, in all we do. -----St. F. de Sales. St. Mary Magdalen di Pazzi once said: "If I thought that by saying a word, however indifferent, for any other end than the love of God, I could become a Seraph, I certainly would not say it." The devil, envying a young monk who was making good progress, appeared, one night, to his Master of Novices, under the form of a good Angel, and informed him that his disciple was already reprobated, and that whatever good he did was of no use to him. The Master of Novices was much grieved at this, and could not refrain from tears whenever he met the young man, who, one day, asked him the reason of his grief. When he told it, the novice said: "Father, do not grieve for this. If I am to be damned, I shall be damned; if I am to be saved, I shall be saved. I serve God not for the kingdom of Heaven, but for His goodness and love towards me, and for the Passion He has suffered for me. If, then, He chooses to give me His Paradise, He can do it; and if He wishes to give me Hell, he can indeed do it: I am content that He should do with me what pleases Him." The following night, a true Angel appeared to the Master of Novices, and told him the one he had previously seen was a devil, and that his disciple had merited more by his act of resignation, than by all the good life he had hitherto led. The office of simplicity is to make us go straight to God, without regard to human respect or our own interests. It leads us to tell things candidly, and just as they exist in our hearts. It leads us to act simply, without admixture of hypocrisy and artifice, and finally, keeps us at a distance from every kind of deceit and double-dealing. -----St. V. de Paul. This Saint always held it as of the utmost importance to have God as his only object in all he did; neither could he bear that those under his charge should swerve in the least from this aim. When one of them was publicly accused of having done something from human respect, he reprimanded him severely, saying that it would be better to be thrown into the fire with feet and hands tied, than to work to please men. Answering a letter from one of his priests, he writes thus: "You write to me that when you speak highly of a certain person in your letters, it would be well for his friends to know it, that he may come to know it too. What thoughts for you to have! Where is the simplicity of a missionary, who ought always look directly to God? If you do not see good in certain persons, do not speak of it; but if you find it, speak of it to honor God in them, since from Him all good proceeds. Our Lord reproved one who called Him good, because he did not call Him so with a good intention. With how much greater reason might you be blamed, if you praise sinful men to please them, and to gain their favor, or for any other earthly and imperfect motive? Remember that duplicity does not please God, and that to be truly simple, we ought to have no aim but Himself." As to his own language, it was candid and simple, and so far from all evasion and craftiness, that no one could ever fear being deceived by him. He also avoided high-flown compliments, which, as they are usually united with dissimulation, are not in conformity with the rules of Christian simplicity. Therefore, he conversed with all simply and cordially, omitting useless demonstrations, as he desired also that his priests should do. The venerable Sister Crucifixa possessed most remarkable candor and sincerity, by which she showed her hatred of all dissimulation and duplicity. The slightest untruth never escaped from her lips, either in the way of civility or of jest, although at recreation she would often employ irony, or other diverting forms of expression, to enliven the conversation. St. Charles Borromeo showed plainly that he was full of this holy virtue, on several occasions, especially in the election of Pius V as Pope. As his uncle, Pius IV, had always disliked St. Charles, there was every reason to believe that the nephew would be opposed, or at least not very friendly, to him, so that he might be taxed with want of prudence in giving power that would be likely to be used for his own ruin. Nevertheless, having before his eyes only the glory of God and the greater good of the Church, and paying no regard to his private interests, he brought about his election. But God took care of him, and caused him to be much favored and esteemed by Pius V. In his speech, St. Charles was extremely candid, and utterly opposed to all artifice and duplicity, and he wished those of his household to be the Same, as he once said to one of them, who, in talking of a certain affair, allowed these words to escape him: "I will tell you sincerely what I think about it." The Saint interrupted him quickly, saying: "Then you do not always speak sincerely! Now, be sure that he cannot be my friend, who does not speak always with sincerity, and say with his lips what he means in his heart." God loves the simple, and converses with them willingly, and communicates to them the understanding of His truths, because He disposes of these at his pleasure. He does not deal thus with lofty and subtle spirits. -----St. F. de Sales. St. Vincent de Paul was of the same opinion, the truth of which, he said, experience daily confirms; for it is but too clear that the spirit of religion is not ordinarily to be found so much among the wise and prudent of the world, as among the poor and simple, who are enriched by God with a living and practical faith, which makes them believe and appreciate the words of eternal life. So they are usually seen to suffer their diseases, their poverty, and all their trials, with more patience and resignation than others. St. Ambrose, in the funeral oration which he pronounced over his brother, St. Satirus, greatly exalts among his other virtues his childlike simplicity, "which," he says, "shone in him like a mirror, so that he could not have failed to please God; for He, as a completely simple being, loves what is simple, and hates and punishes all adulteration." It is related, in regard to St. Gertrude, that the Lord once appeared to a holy soul, and said: "Know that there is not a soul in the world which is nearer and more closely united to Me by simplicity, than that of Gertrude, and so there is none to which I feel Myself so much drawn as to hers." True simplicity is like that of children, who think, speak, and act candidly and without craftiness. They believe whatever is told them; they have no care or thought for themselves, especially when with their parents; they cling to them, without going to seek their own satisfactions and consolations, which they take in good faith, and enjoy' with simplicity, without any curiosity about their causes and effects. -----St. F. de Sales. St. Mary Magdalen di Pazzi resembled in her behavior a simple girl, acting without craftiness, and with great candor and simplicity of heart, accompanied, however, with prudence and such gravity as made her loved and respected by all. The venerable Sister Maria Crucifixa was truly remarkable for this virtue. Though gifted with heavenly illumination, she appeared precisely like a simple little girl, without a vestige of artfulness. She told everything candidly and as it seemed to her, and she thought others did the same; for she could not believe that a Christian would be capable of telling lies. Some examples will show this more clearly. On account of the opinion generally entertained of her sanctity, a great number of letters came to her from many places. She believed that this was owing to the high standing of the convent, and that her companions received as many; but she was much surprised to notice that they were not kept as busy in writing answers as she was. To satisfy herself about the matter, she went around asking them if they received many letters; and they, to favor her simplicity, answered, with polite exaggeration, that they received ever so many. "Why, then, do you not write?" she replied. "I will bring you the ink-stand so that you can answer them." She went for the ink-stand and a pen, and gave them to her companions; but seeing that they could not restrain their laughter, she was unable to understand what the joke was, and remained much puzzled. Having received from Cardinal Tommasi, her brother, who often wrote to her, a letter in which he signed himself "a wretch," according to the frequent custom of the time, she would answer neither that one, nor many others that he afterwards wrote. Being asked the reason, she replied that she did not wish to keep up a correspondence with wretches; and it required no little trouble to induce her to write. But in another pretty incident the Lord was pleased to show how acceptable to Him was her simplicity. A linnet was given to her, which she named Fiorisco. She loved it very much, not only for its beautiful voice, but for the virtues which she said were shown in its actions. It happened once that she wished to pull out two of its feathers, to make a little pen to draw a certain design for an approaching Festival. She thought the linnet was rather unwilling to give them to her, and she was somewhat disedified by his want of devotion. A short time after, a young canary, taking his first flight, rested on the cage of the linnet, which held him by one of his feet with his beak, and began to pull out his feathers with his claws. Seeing what was going on, she hurried to the rescue, and exclaimed, "Ah, Fiorisco! We are growing worse and worse! Is this the way to observe charity?" Then turning to the image of the Virgin, she protested that in this bird she loved nothing except God, but that he had very wrong that day, and she wished that he might be suitably punished. At these words, the linnet, as if he foresaw the coming punishment, stopped singing, and spent the rest of the day in a melancholy manner in a corner of the cage, with his feathers ruffled up. When evening came, a noise was heard from the cage, where poor Fiorisco was struggling grievously, with mournful cries. The servant of God hastened to the scene, and saw the devil, in the form of an ugly crow, attacking her bird. Crying aloud "Sancta Maria," she put him to flight; but she found that her linnet had lost a wing, which had been torn off at the shoulder, and fell on the ground before her eyes; and the injured bird seemed on the point of drawing his last breath. She was grieved at the sight, and prayed to the Lord, asking, as He did not desire the death of a sinner, but his conversion and life, that He would grant that her Fiorisco, though he had been punished, might not die. Nor was the prayer in vain; for, after she had taken the bird in her hand, and caressed it a little, it suddenly recovered its usual strength, and appeared with a new wing, fully provided with bones and flesh and skin, in nothing different from the first. except that the feathers were handsomer. Astuteness is nothing but a mass of artifices, inventions, craft, and deceit, by which we endeavor to mislead the minds of those with whom we are dealing, and make them believe that we have no knowledge or sentiment as to the matter in question, except what we manifest by our words. This is wholly contrary to simplicity, which requires our exterior to be perfectly in conformity with our interior. -----St. F. de Sales. When this good Saint was told, by a friend of his, that he would have been successful in politics, "No," he replied, "the mere name of prudence and policy frightens me, and I understand little or nothing about it. I do not know how to lie, to invent, or dissimulate, without embarrassment, and political business is wholly made up of these things. What I have in my heart, I have upon my tongue; and I hate duplicity like death, for I know how abominable it is to God." St. Vincent de Paul, too, was utterly opposed to worldly policy, and in his dealings with others, was most careful to avoid all evasions and artifices. The very shadow of falsehood affrighted him, and he had a horror of equivocations, which deceive an inquirer by answers of double meaning. When a simple soul is to act, it considers only what it is suitable to do or say, and then immediately begins the action, without losing time in thinking what others will do or say about it. And after doing what seemed right, it dismisses the subject; or if, perhaps, any thought of what others may say or do should arise, it instantly cuts short such reflections, for it has no other aim than to please God, and not creatures, except as the love of God requires it. Therefor, it cannot bear to be turned aside from its purpose of keeping close to God, and winning more and more of his love for itself. -----St. F. de Sales.